Power consumption is for sure a substantial part of our monthly expenses; though we usually accept it as an item we can do little about. If analyzed, it is found that the major chunk of our domestic power consumption comprises heating and cooling gadgets. There are some tips that can very effectively help bring down power consumption and result in a substantial saving by way of reduction in power bills. Being a bit conscious of the options available for the types of heater with its running cost in mind goes a long way in making huge savings. Do not just go and buy the first available electric heater; make some inquiries whether a gas heater could be an option and if so, which way you end up paying lower running cost. It may also depend on the availability of sources of power in your area and no one stops you from going in for the type of gadget that would be economical to use at your location. The same considerations hold true if you are going in for changing an old heater. It pays to learn to regulate the thermostat; though not too technical, most of us take it to be something not to be fiddled with. 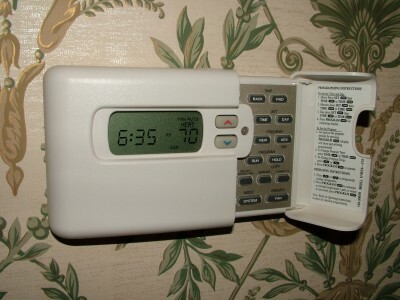 Only few are aware that thermostats with timer can automatically regulate power to be just required for day and night time; and the results would perhaps pleasantly surprise you with the economy. Most of us are quite comfortable with temperature settings of 70 and 50 degrees respectively during day and night time. It serves well not to change these settings too frequently as each change causes extra power consumption. During spring and fall when you feel comfortable in your light woolens, it is advisable to switch off heating system. Inefficient or worn out insulation on the doors and windows in your house too is one of the major reasons for unnecessary power consumption; getting storm doors and windows installed does help save power particularly during cold season. Warmth received from the sun needs to be put to best advantage; letting extra sunlight enter the living area by folding the curtains and trimming tree branches that obstruct sun also keeps the load on your heating system lower. Areas like attics and basement that do not have heating panels need to be better insulated. Getting the heating system serviced by professionals before the onset of winter keeps it running with optimum efficiency when the load on it is at its peak. You may even use your common sense to see that the air filters are kept clean and the approach to the heating equipment unobstructed; these are commonly missed points of power wastage. Inquiries should be made with your electric company to know if units consumed during peak and non-peak hours are charged at different rates; if so manage your consumption judiciously. A small example of this is that washing machine can be timed to operate during ‘cheaper’ hours. Likewise, inquiries with the electric company can make you wiser about other steps for energy saving. It just needs you to be conscious of the economy in domestic power consumption you can bring about without subjecting yourself and your family to any discomfort. I believe you can agree that the suggestions above are not too difficult to do. It may seem like a chore, but believe me, the amount of money you’ll save on lower electricity bill is well worth it. After you have done every possible thing to make your home more energy efficient, you can now implement a home solar power system to supplement your energy needs to bring your monthly electricity bill even lower.